By choosing weight watching appetizer recipes combined with nutritious proteins, complex carbohydrates, and healthy fats, a savory buffet of appetizers will appeal to your taste buds and your calorie count. Appetizers make great finger food when served before a main entree, but they also make delicious meals or tasty snacks when combined with a balanced, nutritious approach. It is best to choose moderately-sized, low calorie portions consisting of vegetables, beans, and low-fat cheeses, such as ricotta and mozzarella cheese when preparing low-fat diet recipes. Why not give yourself permission to tantalize your taste buds with some of these weight watching appetizer recipes? Using veggies as a base keeps calorie counts low with these recipes. These eggplant and tomato rounds have a delicious Italian flavor. Coat a baking sheet with non-stick cooking spray. Place eggplant slices in a single layer on the sheet and lightly brush with one-half teaspoon olive oil. Broil until slightly browned. Turn slices over. Brush eggplant with remaining oil and broil until lightly browned. Top each eggplant round with a slice of tomato and broil for one more minute. Evenly sprinkle cheese on each round and sprinkle with basil and pepper. Broil until cheese melts, about two minutes. Makes 2 servings. 1 serving equals 3 rounds. 181 calories, 8g fat, 10g fiber. Part-skim ricotta cheese keeps this creamy filling low in fat. Combine ricotta and salt; spoon into small baking dish. Drizzle with oil and sprinkle with pepper. Bake at 375 degrees for 20 minutes or until cheese is slightly browned and bubbly. Let sit for 15 minutes. Spoon baked cheese into hollowed-out tomatoes or mushroom caps. Makes 6 servings. 1 serving equals 2 tablespoons of filling, 80 calories, 5g of fat, 0g fiber. 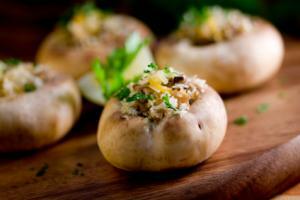 Tomatoes and mushrooms have few, if any, calories or points for weight watchers when eaten in moderate-sized portions. Moreover, they are part of a healthy list of low-fat foods. 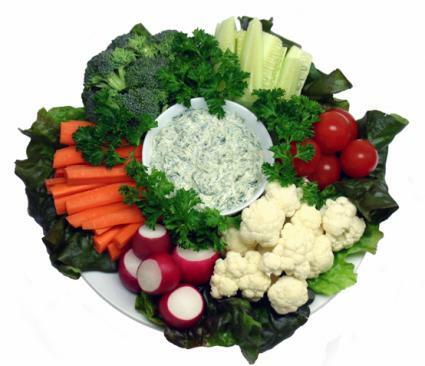 Dip is a popular choice, and using veggies or baked chips for dipping helps keep it low in fat and calories. Seven layer dip is loaded with Southwestern flavor, and it's always a crowd pleaser. In food processor or blender, puree beans, hot sauce and water. Transfer to 12" round pan or platter and spread into a thin layer. Leaving about a 1" border, layer tomato, green pepper and salsa evenly on top of the beans. Leaving another 1" border, spread sour cream on top of salsa. Sprinkle evenly with shredded cheese, scallions, and olives. 1 serving equals 1/8 of dip recipe. 89 calories, 1g fat, 2g fiber (Does not include tortilla chips). 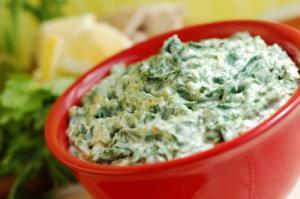 Spinach is loaded with nutrients, and using non-fat sour cream and part-skim ricotta makes this dip creamy and low in fat. In food processor or blender, blend sour cream, cheese, lemon juice, garlic, salt, and pepper. Transfer to medium bowl and stir in spinach, water chestnuts and scallions. Cover and chill for one hour. Serve with raw vegetables. 1 serving equals ¼ of dip recipe. 83 calories, 3g fat, 1g fiber. Weight watching appetizer recipes make nutritious snacks, finger foods, or meals while pampering your taste buds with a medley of flavors without all the extra calories. Experiment with different types of low-fat appetizers and hors d'oeuvres recipes: try vegetable, bean, or fruit dips, finger foods, relish trays, salsas, and spreads like low-fat creamy hummus. Pass on the usual fatty fare and give yourself permission to splurge on a wide variety of low-fat diet appetizers.